In the peace, tranquility reigns for the spirit. Discover your peaceful place and be with the tranquil. In the peace you will discover much about yourself. You will always be nourished and the Light will shine ever more brightly with you. So seek those moments of quiet and calm the mind, gain tranquility. This will give you a great reward. This message will be included in our new book “Love Is The Key” which we expect to be published in March 2012. See also our book Earth Messages of The Love Energy. Kay channelled this message from The Circle of The Light of The Love Energy mid 2010. It is included in our book Earth Messages of The Love Energy. Much is happening and will continue. It is all to do with the Earth’s vibration. It needs help. Earth needs assistance from every member of the human race. Please play your part – lift the vibrations by doing everything from the heart. The heart and love are the key to the changes that need to be made. Our message seems desperate because we see so many sad events on Earth and it only needs the love, the action of love, to change the balance. Help us change the balance. Negativity needs to be released and positivity reign in every being. Let the soul show forth. Please also see the messages posted earlier. These can be found in the ‘Archives’ section on the lower right of the page. This message is from our soon to be published book ‘Love is the Key‘. Love energy will heal at the very core of the being. This is where all healing needs to take place. The soul, spirit, essence will be loved and therefore nourished, become fertile and will be free to soar, it will be strengthened and know its purpose once again. This allows you to show the love in your heart and transform not only yourself, but all who come in contact with you. Show your Light and the love within your being as this will change your perspective on all aspects of your life. Let it be seen by others. We, The Circle of The Light of The Love Energy – The God Force Energy – remind you that love is the purest energy form. Let us heal the spirit, soul, essence and allow Earth to enter another higher dimension. Kay channelled this message from The Circle of The Light of The Love Energy in July 2010. It is included in our book Earth Messages of The Love Energy. • Growth for the physical being by participating fully in the human existence. • Discovery of the spirit within and the ability to connect with the Source of All. Deal with all physical needs honestly, being true to yourself and those you are responsible to and for. Transact your dealings from the heart to ensure that honesty and sincerity always prevail. To enable the spirit within to be discovered, nourished and allow expansion, the human being needs to make a conscious decision to explore the inner ‘self ’ – spirituality. The individual’s spiritual journey upon the Earth Plane will take different forms, which is to be expected, as all are different! All earnest exploration along the way will be beneficial, nourishing the spirit within, allowing growth little by little as each discovery is acknowledged and awakens the spirit and is accepted by the mind. Start the journey or continue your journey, as eventually those who truly seek will unite with the spirit without, the Source of All; finding unity, the great Oneness. “Offer empathy” – channelled spiritual message from The Circle of The Light of the Love Energy. Kay channelled the following message from The Circle of The Light of The Love Energy at the end of January, 2012. Awaken the sensitivity centre within your being, the centre of awareness that has come to you through your many experiences in life. All of these experiences will allow you to connect with others through empathy. Offer your empathy as a listening ear and with an understanding nod. Do not dominate, allow their story to unfold. Remember they need to work through their events just like you. Allow them to seek within and discover their inner wisdom and beauty so they heal. Let them lay the foundation for their sensitivity centre to offer empathy to those in need. At our meditation group yesterday evening, 14 February 2012, Kay channelled the following message from The Circle of The Light of The Love Energy. We come again tonight, as we want you to know that the Light in your heart needs to be full of joy. Joy that will touch the world. Joy that will give you nourishment. And let this Light in the heart connect with all of your being – the physical, the mental and the spiritual, and let your potential be vast. Stand fast in the Light and be your true self. Kay channelled this very nice message from The Circle of The Light of The Love Energy yesterday morning, 9 February 2012. The message was from Kay’s softly spoken female guide whose picture is given in my previous post. We are told that in Heaven there is only love. It is in love that you come. From love you come, to love you will return. If you can return as love, then complete you will be. The time you spend upon the Earth is a time for you to grow. It is a time for you to be who you truly are, the Light within you. This is a task you are all given. It is a task we urge you to complete. Be Light and Love on the Earth. Be compassionate to all that you see, and all that you know, and let your essence be. So when it is time to return to love, you will love be. See also our first book of Kay’s channelled messages Earth Messages of The Love Energy. We would like to share with you some things about spirit guides, which we all have. A few months ago Kay arranged for a psychic artist to draw one of her spirit guides. This is a bit more complicated than normal as Kay is in touch with several spirit guides, who are all members of the “Circle of The Light of The Love Energy”. 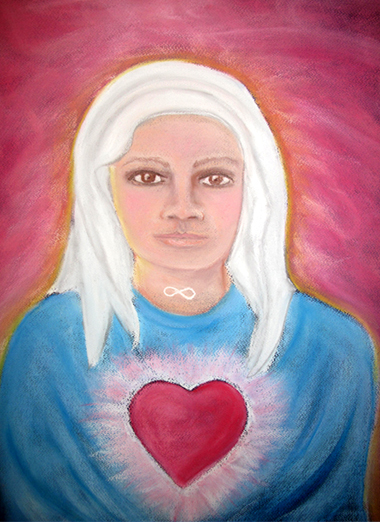 This spirit guide picture was drawn by psychic artist Rachel Auton. Rachel also does a psychic reading for her client when doing the drawing. Here is an excerpt from Rachel’s reading for Kay, which explains the process used. Rachel ran a meditation group that Kay had attended four years ago. During this time Kay started to see the features of a man, just the nose and eyes. Then Rachel moved to Australia and we lost contact. When Kay joined another meditation group, gradually the whole face appeared along with a further two guides, one male and one female. Recently Kay found Rachel’s website and regained contact. Kay arranged for Rachel to draw one of her spirit guides and this picture is the result. Mary’s face with the veil over the hair, is exactly what Kay has been seeing through her third eye. Rachel had no knowledge of Kay’s guides before doing the drawing. For further information about Rachel Auton, energy worker, teacher and psychic artist go to her website Lotus Lifestyle. Rachel’s website contains a fascinating picture gallery of many of the spirit guide pictures she has drawn. We are a spirit temporarily inhabiting a physical body. Most of us have been here on Earth in many previous lives. The purpose of us coming here to the physical plane is to learn many lessons, which will contribute to our spirit’s ongoing spiritual development. Each time we incarnate on Earth we are assisted by a number of invisible spirit helpers of the Light. We each have a main guide who is with us for life and likely was our main guide in some of our previous lives. The main guide’s task is to assist the individual to accomplish their life’s work or purpose. There are also a number of other spirit guides who are there from time to time to help us with particular things. The main guide also acts as a gatekeeper so that only other appropriate spirit helpers may be given access. Guides generally cannot do anything to help us unless we ask for their help. They only provide positive guidance. We have free will and they are not allowed to do anything that would control us. Kay channelled this message from The Circle of The Light of The Love Energy in March 2010. It is included in our book Earth Messages of The Love Energy. Messages have been extended to you asking for actions to come from the heart. Perhaps we need to clarify this to make it even easier to be understood. Value love. Give it the highest value, like you value money. Love has the higher value. Actions in the name of love hold all the components because it will allow compassion, understanding, harmony, kindness, the caring – these are the things that hold true value. A bank balance won’t do it. The heart holds the power and will supply all that is needed. We hope this is clear because very important to change the value understanding. We have told you that all life is precious; we have asked you to live from the heart. We hope that this message clarifies the importance that humankind should place on love. Gifts from God are real treasures when accepted with humility. The treasure is for sharing – not for boasting about. It’s for sharing and helping to spread the Light. Use the gifts given to you wisely.